Offering an all-season indoor swimming pool and Gymnasium Harbourview Hotel Macau is a 10-minute walking distance away from the Macau Ferry Terminal. The hotel was built with the design based on 18th Century Prague. Free WiFi access is available. Macau International Airport is a 15-minute drive away. 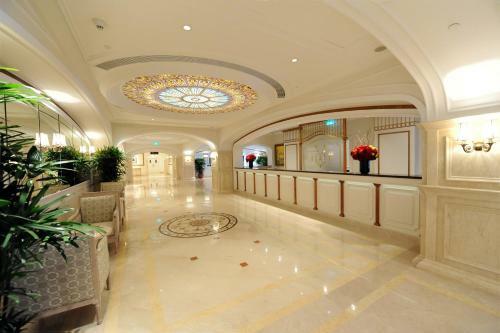 The hotel is 100 metres from Lotus Statue 700 metres from Macau Ferry Terminal and 1.6 km from Mount Fortress. Each room here will provide you with air conditioning and a minibar. There is also a refrigerator. Featuring a bath or shower private bathroom also comes with a hairdryer and slippers. Extras include a desk and a safety deposit box. At Harbourview Hotel Macau you will find a fitness centre. Other facilities offered at the property include luggage storage and shops (on site). Praha Restaurant offers Asian dishes and international culinary delights you can also enjoy snacks wine and cocktail at Praha Bar.